As a kid, I watched a lot of R-rated films and TV shows without any apparent harm. I loved "Silence of the Lambs" and "Pippi Longstocking" equally. What did mess me up, though, was the evening news. I particularly remember being very little - three or four - and playing in our living room while my dad watched the news. They ran a news story about a woman involved in an escalator accident when her shoe got stuck in the escalator. Of course, in my childish imagination she was dragged into the depths of the escalator and never seen again. The next time my mom and I went to Woolworth's, I stared at the escalator, trying to figure out how a whole person could be sucked into an escalator. I wondered what was in the body of the escalator, underneath the treads. Probably trolls. And, to my mom's bafflement, I'm sure, I refused to get on the escalator. I would spend the next eight years or so of my life taking stairs or elevators until the pressure of being an adolescent mall rat forced me to confront my fears and save face in front of my friends. But now I'm an adult. 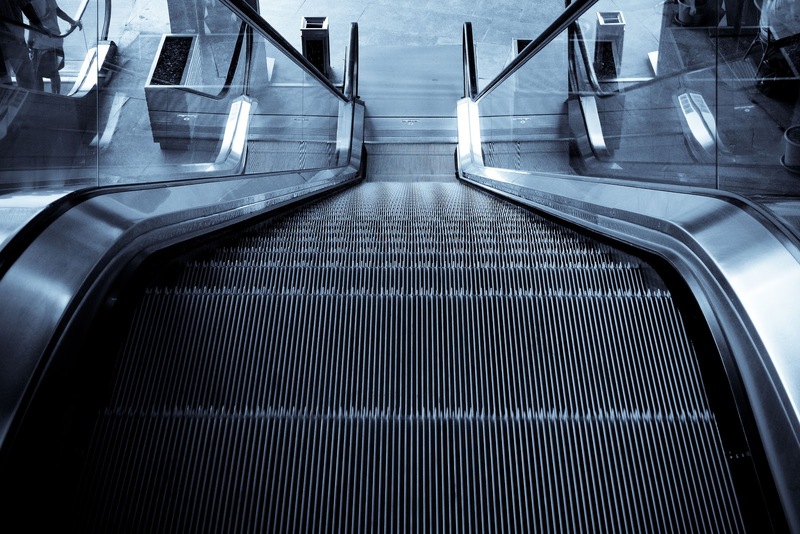 I've researched escalator accidents and being aware of how to prevent them (a handy tip: don't wear Crocs on escalators. Actually, to be safe, you might want to never wear Crocs). I realize no one is getting sucked into the escalator mechanism and that, worse case scenario, you're probably just going to mangle a toe or too -- I'm a marathon runner, we mangle our own toes, that's no big deal. I understand there are no trolls. I still hesitate, do a little stutter-step, every time I get onto an escalator, though. I just want to be careful. Old fears die hard. Anyone else have any irrational perfectly logical childhood fears? What do Crocs do on a escalator? They look reasonably streamlined to me! I was terrified of fire - in any setting. Matches, campfires, anything. Grew out of it when I was 8 or so but looking back it was fairly logical! Okay, I don't have fear (from horror movies), but I have little rituals carried over from when I was a child. I hate stepping on a drain grate (you'd never know if it would collapse), I always make sure the elevator or automatic door is fully open before I go through, usually by sticking an arm in it, but at least it's open. When I was growing up in England, they had some ads or something about safety on escalators. They freaked me out enough that I still have problems riding escalators. I'll take the stairs when given the choice. Talking of freaky English ads, I saw the Lonely Water ad on TV late one night and had nightmares about it. I was in my mid-twenties at the time. It's an ad warning children not to play near isolated bodies of water, in case they are claimed by a grim reaper figure representing the Lonely Water. The voice-over is super creepy. If I'd seen it as a child I would have been terrified. I remember hearing about a kid getting his foot stuck in the elevator, and then once my brother let his flipflop get stuck (he just didn't pick up his feet at the end). I'm like Cheree--I still have little rituals that I've done since childhood, but nothing really scares me. I was always worried my shoelace would get caught in one when I was little, but I got over it eventually. I swear. New follower here - loved this post, you made me laugh, several times. Am posting about FEAR tomorrow as part of my A-Z, but I don't mention spiders, and I am deathly afraid of spiders, regardless of how tiny. The Oatmeal ridicules crocs in his rabies vs. babies strip, so you're in good company. I had a thing about escalators as well. And yes, I still hesitate before getting on, or off, one. Weird, huh? I wasn't worried I'd be lost forever. Just afraid I'd take an embarrassing nose dive. I'm a fellow writer and your newest follower. I'm a new follower from the A to Z Challenge. I never had a problem with escalators until I was about 14 or 15, when I had a dream that I was stuck on an escalator and someone pulled out a gun (I grew up in a small town where you never heard about violence, so not sure where that dream came from!). Ever since then, I hesitate before stepping on an escalator!